During the period 14-18th Aug 2017 a field trip was made to the Omsk, Novosibirsk and Altai Krai regions of Western Siberia, Russian Federation by CIMMYT and the Global Rust Reference Center (GRRC), Aarhus University. Organised by Dr. Alexey Morgunov (CIMMYT-Turkey), the visit aimed to get more information on the recent reports of large scale stem rust outbreaks covering millions of hectares in the region (Shamanin et al., 2016). It provided the opportunity to meet with the leading wheat scientists in the region and visit key wheat research institutes to gain a better understanding of the current stem rust situation. With approximately 7 million ha of short season high latitude spring wheat grown in Western Siberia, along with smaller – but increasing areas of winter wheat and some durum wheat, the region is an extremely important wheat production area. Photo 1. Susceptible stem rust reactions on late maturing variety. In the Omsk region, most field plots and commercial fields were 1-2 weeks prior to harvest time (90-100 day growing season) whereas wheat crops were close to maturity or mature in the Novosibirsk and Altai regions (80-90 day growing season). 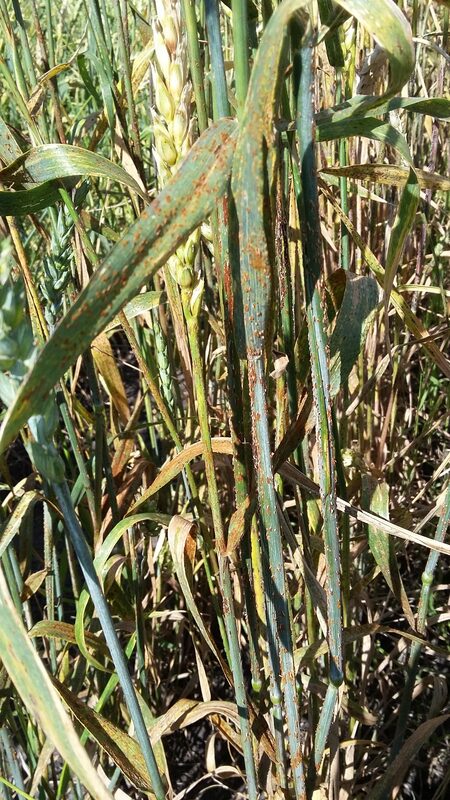 2017 proved to be a non-epidemic year for stem rust, but even so the disease was universally present at every site visited. Bread wheat, durum wheat and barley were all affected, especially late maturing materials. Several grass species were also affected and barberry, including B. vulgaris, was relatively common in urban areas. Some resistant materials were present, but several susceptible or highly susceptible lines or varieties were observed in the trials visited (Photo 1). 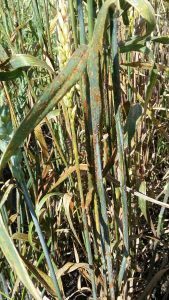 Stem rust was not considered economically important until 2015 when a local epidemic occurred in the Omsk region of Russia and neighboring areas of Kazakhstan and affected more than 1 million ha. Stem rust occurred again in 2016 though the spread, severity and losses were less (Shamanin et al., 2016). The weather in 2015 and 2016 was conducive for stem rust – not too hot and dry in June (which is often the case) followed by moist and warm weather in July. 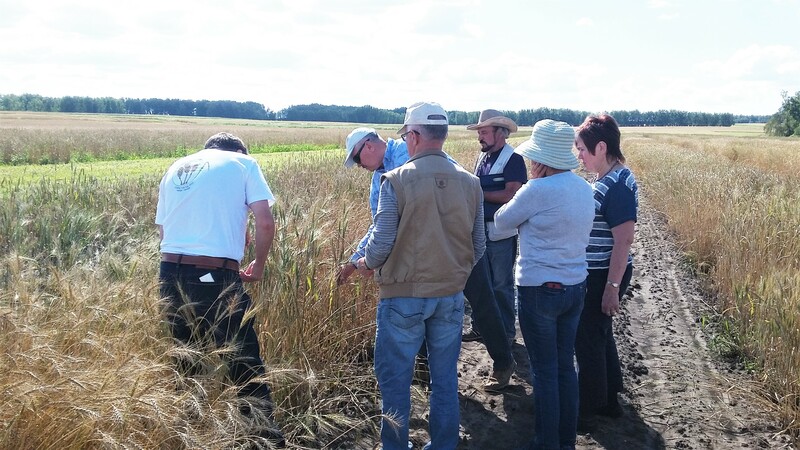 The trip started in Omsk with visits to the research trials of the Omsk Agrarian State University (Photo 2) and the Siberian Research Institute of Agriculture. This region was of special interest, as in 2015 wheat production in this area was affected by a major stem rust epidemic on an estimated 1 million ha. The biggest outbreak in this region in recent history. In 2015, stem rust appeared early with symptoms visible in the field at the end of July (heading). Typically in the past stem rust would not appear until mid August, too late to build up and cause any damage. The 2017 season proved to be a more typical year with hot and dry conditions and absence of June rains. As a result stem rust had only appeared after the first week of August, too late to cause any damage in commercial fields. 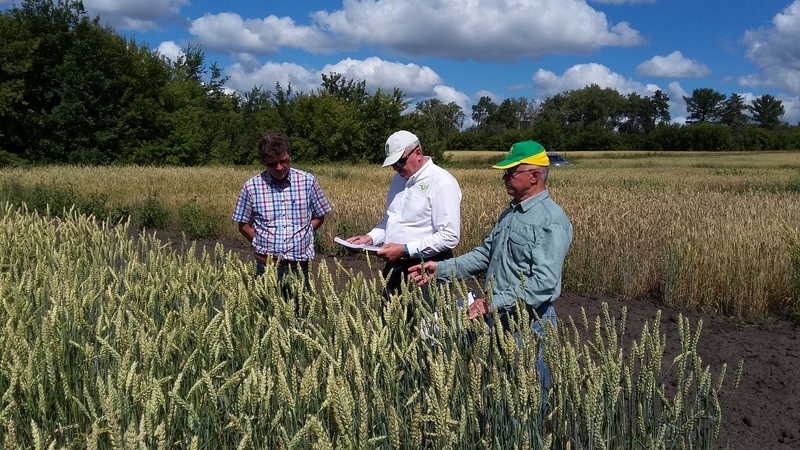 Trials in commercial production areas approximately 120 km south-east of Omsk were affected by drought stress and only trace levels of stem rust were present. Trial sites close to Omsk city had significantly higher incidence and severity of stem rust. Some late planted or late maturing susceptible materials were showing reactions up to 40-50S. Stem rust was observed on bread wheat, durum wheat and barley. Grasses, notably bromus sp were also observed to be infected with stem rust. Leaf rust was prevalent throughout the trial sites visited. Trace amounts of yellow rust were detected at one site – an extremely unusual occurrence for this region and so far not reported according to our local hosts. Barberry, including B. vulgaris, was present in urban areas – commonly planted as hedges. But apparently it was rare or absent in natural forested areas. Previous sampling of stem rust in the Omsk area in 2016 has revealed high race diversity for stem rust (14 races from 14 samples – see GRRC report). Samples of stem rust from the 2017 season will be analysed by the GRRC in Denmark. In research trials of the Institute of Cytology and Genetics, Novosibirsk, stem rust was universally present, but incidence and severity was lower than in Omsk. In this region, it was considered that stem rust was appearing too late to cause any economic damage and no large scale epidemics were reported. A randomly surveyed commercial field on the way to Barnaul, revealed low levels of stem rust on late tillers (and also grass sp.) but the crop was close to maturity and uneffected by stem rust. Research trials of the Altai Research Institute of Agriculture, Barnaul were visited (Photo 3). As at previous locations, stem rust was universally present throughout the trials. But as with other locations, in 2017 it appeared late and was not a problem in commercial production fields. Late planted durum materials on station were heavily affected by stem rust. In 2016, the situation reported was entirely different in this region. Rains in June (and July) combined with warm temperatures had resulted in stem rust appearing in mid July. An estimated 2 million ha were considered to have been severely affected, resulting in an estimated 30% total production loss in the region. Increasing areas planted to winter wheat were also considered another potential factor that may be influencing the stem rust cycle in the region, giving the pathogen an opportunity to move from maturing spring wheat to emerging winter wheat at the end of the season. Control efforts in 2016 were compounded by the unusual rainfall, making it difficult to undertake spraying operations. An example was cited of two adjacent fields both growing the same variety; one field was able to be sprayed with a resultant yield of 3 t/ha, the other was unsprayed resulting in a yield of 1.7 t/ha. The visit highlighted the importance of wheat in this region and the strength of the research programs, but also the vulnerability of grown varieties to stem rust. Significant changes appear to have occurred in recent years, making stem rust an emerging disease of economic concern. Further research is urgently needed, both to understand the pathogen dynamics and also to increase the proportion of resistant varieties. The scale of the reported epidemics if weather conditions are suitable, coupled with the apparent high race diversity may have serious implications for neighboring regions and beyond. Sincere thanks are given to all the wheat scientists at all the institutes visited for the time they dedicated to show their research activities and for the wonderful hospitality that was offered throughout the trip.